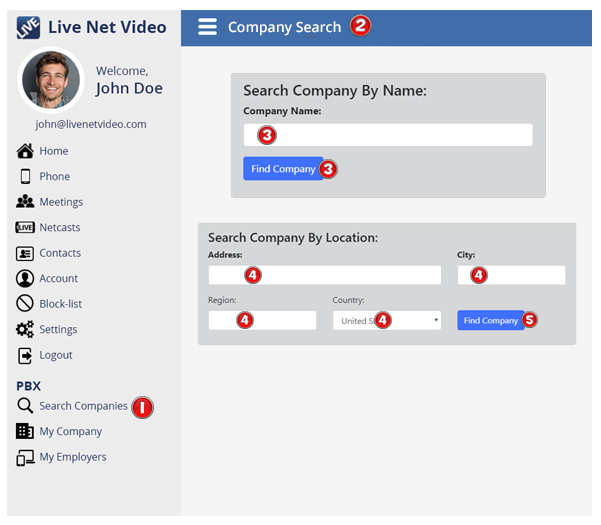 Search for Company’s that have the Live Video Connector, so you can contact them in Live Interactive Video with just a click on the Company’s name. The Company Search screen displays. To search by Company Name, enter the Company name and then click the Find Company Button. To find a Company by address, enter the address, city or region and country. Once you’re finished entering the information, click the Find Company. When a Business is found using your search criteria, a screen is displayed to show the results. To view the company’s profile, click on the company image. To view the company’s departments or video PBX lines, click on the Video Extensions Button. If the search results list is long, you can use one of the filters to sort either the list by company name or eMail by A-Z or Z-A. 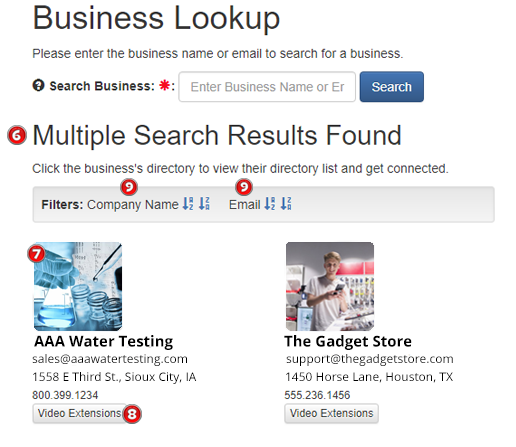 To start a new search for a company, type their name or email address in the search box. Once you’re finished entering the information into the search box, click the Search Button.